The goal of DroidHC is to create a human capable droid that can operate in human environments. 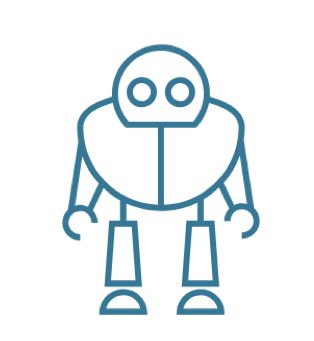 DroidHC represents the movement of robotics from fixed use, caged environments to general-purpose, real-world environments. Hearing: DroidHC has directional 360 sound sensing. This allows the robot to locate sounds and voices. The voice system handles speech recognition and sound recognition. Vision: DroidHC has 100fps RGB-Depth sensing. This allows the robot to understand the world in real-time, develop better 3D world models, and to learn more quickly. This coupled with advanced computer vision algorithms allows the DroidHC to do some amazing things. Touch: The droid has the ability to sense touch in multiple zones of its body and hands. DroidHC can sense the force applied from the environment and the force it is applying. This sense of touch is essential to safety and fine-grained interactions. Kinesthesis: Kinesthesis is the sense of the position and movement of body parts. DroidHC comes with an array of 9dof sensors tracking the position of every part of the droid in real-time. Because of the humanoid form factor of DroidHC, this droid can walk and manipulate objects with its hands just like a human. DroidHC has complete 4 fingers and thumb hands with 15 degrees of freedom. This enables the robot to utilize tools and environments designed for humans. The droid’s low-level reactive control system provides balance and safety, while the high-level cognitive system allows the droid to do complex operations. We are initially targeting behaviors for manufacturing environments, but DroidHC is a truly general-purpose humanoid droid.